President Museveni has hailed the spirit of selflessness and voluntarism in leadership. He said that such actions are characteristics of true National Resistance Movement cadres who understand the Movement priorities, agenda and methods of work. 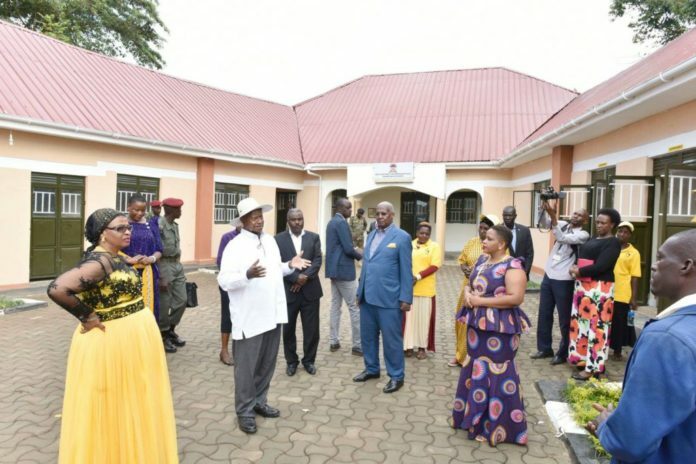 The President, who had earlier commissioned Sembabule School of Nursing and Midwifery in Sembabule Town council and the Anifa Vocational and Entrepreneurship Skills Training Institute in Mitete Trading Centre, both of which were put up by MP Kawoya, commended her for being a foresighted leader in establishing educational institutions in her constituency that will produce professionals whose skills are not only on demand in the labour market but which also helps in providing the much needed services like midwifery and nursing in Sembabule District in particular and the entire country in general. President Museveni credited Hon. Kawoya as a reliable NRM cadre who has all the time stood firm and defended the Movement cause and ideals. He also thanked the people of Sembabule District for always voting her to Parliament and for supporting NRM all the time. He advised Ugandans not to misuse their electoral mandate by voting people who are not devoted to the development of their areas and the country as well. “Don’t vote MPS whose main pre-occupation is opposing government programmes instead of working with the government and following-up on your constituency development demands. You would be cheating yourselves if you voted for such people,” he said. The President used the occasion to assure Ugandans that the government will decisively defeat criminals who are masterminding crime in the country especially the recent murders and kidnappings. He appealed to citizens to work with security agents, especially by doing timely reporting of criminals, so as to receive quick response from security. On her part, Hon. Anifa Kawoya thanked President Museveni for the good leadership he has offered the country and the NRM that has transformed the country.